Why has gluten become the new food villain? Haven't we eaten gluten for thousands of years without any problems? To answer this question we must pick on a particular grain: Wheat. The short answer: Yes and no -- but mostly yes. The first question that needs to be addressed is why has gluten become the new food villain? Haven't we eaten gluten for thousands of years without any problems? To answer this question we must pick on a particular grain: Wheat. Wheat has the most gluten out of any other gluten-containing grain (the others are kamut, spelt, rye, and barley). Gluten has qualities that humans love. Gluten is what makes bread fluffy and light, as well as sweet and chewy. In addition, its versatility in the baking world (due to the high gluten content) has made it a popular flour for all baked goods. However, gluten didn't used to be this bad. We have bred our wheat to contain more and more gluten because that's what people like. We've taken the ancient einkorn wheat, which has only 14 chromosomes, and bred it to become a more versatile 42-chromosome emmer wheat, according to Wheat Belly author, William Davis. This is one of many reasons why so many people are becoming sensitive to wheat -- our immune systems don't recognize it as food. Typically in the past (before food processing), we trusted our taste buds when making certain food choices. This was an important survival mechanism to make sure we didn't eat the exact same food everyday. We continued to seek new and novel foods to ensure we had a diverse amount of nutrient consumption over time. Would you want to eat broccoli every single day? You probably answered "no," thinking about how bored you would get with the flavour after a couple of days. We have this innate mechanism that tells us that a food just isn't appetizing anymore when it's over-consumed. But with food processing, we (by "we" I mean food scientists in lab coats with enormous budgets -- see Salt, Sugar, Fat for more on this) have figured out ways to morph and change foods into different food items, fooling our taste buds into thinking we are eating different foods when we actually aren't. 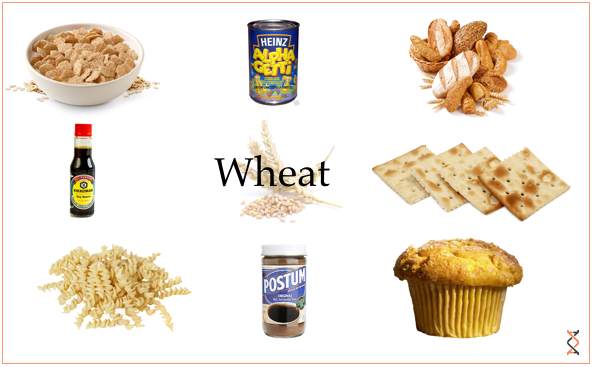 For example, wheat can be made into crackers, pasta sauces, drinks, flakes, cakes, muffins, bagels, and the list goes on (see below). Thus, we end up eating the same food day in and day out. This can lead to sensitization to that food, an effect that was noted hundreds of years ago by Hippocrates himself. So we've bred our wheat into a 42-chromosome "frankenfood" that our immune system no longer recognizes (and therefore attacks). And we've then consumed it way more than we were ever meant to consume one particular food. Are there consequences for these actions? The answer is a big YES! 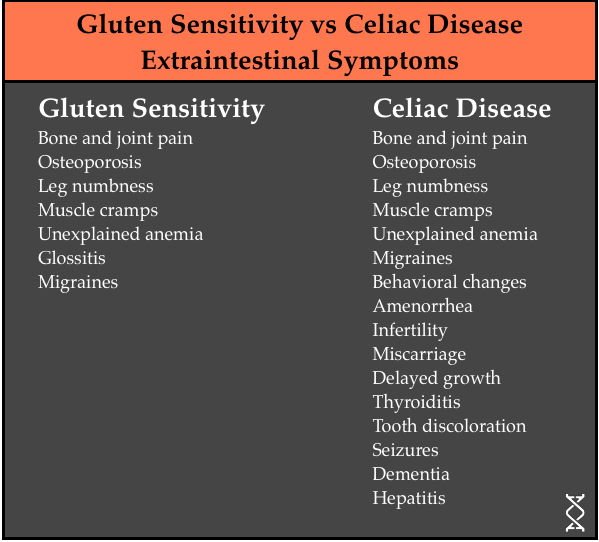 It is first important to distinguish between celiac disease and NCGS. Celiac disease requires the presence and confirmation of damage to the villi, the absorptive cells of the small intestine. About one per cent of the population has celiac disease, and about 90 per cent of those people are undiagnosed. Gluten sensitivity is harder to diagnose as there is no standard diagnostic criteria present to date. The best way to determine if you are gluten-sensitive is to do an elimination diet for one month, and then reintroduce gluten to see if any symptoms result. This is the gold standard. The estimates are that 10 to 20 per cent of the population is sensitive. Many functional medicine practitioners note numbers up to 40 per cent in their practice, and I see this clinically as well. The earliest descriptions of celiac disease in the first century A.D., in the Aretaeus books in the 1500s and then more recently in 1887 by Samule Gee all noted the intestinal manifestation of the disease. The introduction of the small bowel biopsy between 1950 and 1960 confirmed the gut as a target organ. Because celiac disease has historically been diagnosed as a result of damage to the small intestine, it's easy to assume that gluten sensitivity is just a disease of the gut. But sensitivity to gluten actually has effects across the entire body. Check back soon for Part 2 where I outline the good news and discuss two case studies.